← Running Your Socks Off? I just finished Ann Voskamp’s book~~One Thousand Gifts. I was taken by her writing style and more so by her revelation of finding JOY in the mundane of the day-to-day. Her pain in life was raw and you could identify with her search for God in the dark places. It was no struggle at all to immediately identify that even in our mundane or in our darkest hours God has placed gifts for our joy over and over and over and over again. Her book is based on giving thanks to God for his goodness and counting it all joy. After reading the book the part that stayed with me most was “Empty to fill”. giving you water when you are dry and restoring your strength. She then simply writes: It’s the fundamental, lavish, radical nature of the upside down economy of God. And I mediate on what this means………….. It is here in her book that I realize that the fullness of God, the fullness of Joy is when we empty ourselves to be filled with more of the Holy Spirit. One definition of empty was vacant. If this temple becomes vacant then there will be plenty of room for the fullness of Christ. One definition of full was: completely filled; containing all that can be held; filled to utmost capacity: a full cup. It is here that I truly can visualize “my cup runneth over”. And so now I pray: Empty to Fill, so that I not only can dwell in the house of the Lord forever but that he too will take this vacant temple and fill me with His Spirit. It’s a whisper of a prayer that I am determined to continue to repeat until the fullness of God and his Joy overflows with in me. 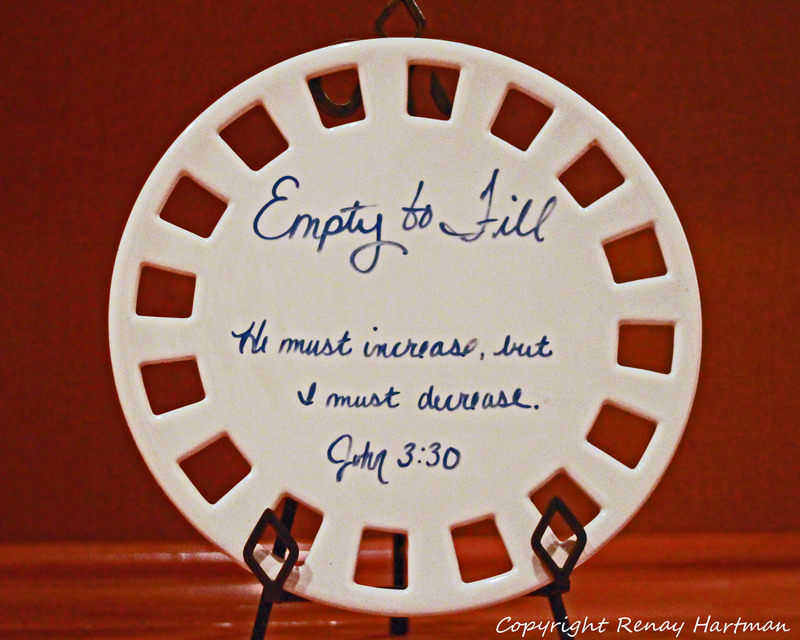 Empty to Fill has become a prayer for me……………everything in our lives must empty to be full. Everything from pride to an extra drawer with too many items. We must empty to fill. We must abide in him to be ever-present to allow him to work in our temple. I am praying this whisper of a prayer “Empty to Fill” will help to free me in a thousand ways to fully enter into a fullness of God and all the Joy that is therein. How will you be thinking on Empty to Fill????????? ?